Terrazzo is a composition material that is poured in place. It consists of marble chips or decorative colored glass aggregates mixed with either a cementitious or epoxy binder. It is poured, cured, then ground and polished. Terrazzo is an extremely durable product and is one of the most cost effective systems based on its life cycle. It is also easy to clean and maintain because of its smooth and seamless application. This makes it ideal for places where sanitary conditions are a must. There are certain steps that need to be followed in order for a terrazzo project to be a success. Knowing the process and following the steps will help make it easier to plan for a terrazzo floor. Floor prep is critical for the success of any terrazzo project. The concrete surface needs to be mechanically shot blasted or diamond ground to create a strong bond between the terrazzo and concrete. This process allows for a clean and scarified surface for the terrazzo to properly adhere to. Prior to any work, the concrete slab must be tested for moisture. If the moisture levels are to high for the specified reading, then a moisture mitigation treatment is required. This treatment is applied over the top of the prepped concrete substrate to prevent moisture from delaminating the terrazzo after installation. Moisture is epoxy terrazzo’s worst enemy and it is critical to treat it if necessary. If cracks in the concrete are present, a flexible membrane can be installed over them to help absorb some horizontal concrete movement. This process can be done with a full coverage membrane, where the entire area is covered, or it can be done where just the cracks are treated. Terrazzo is laid out using zinc or brass divider strips. 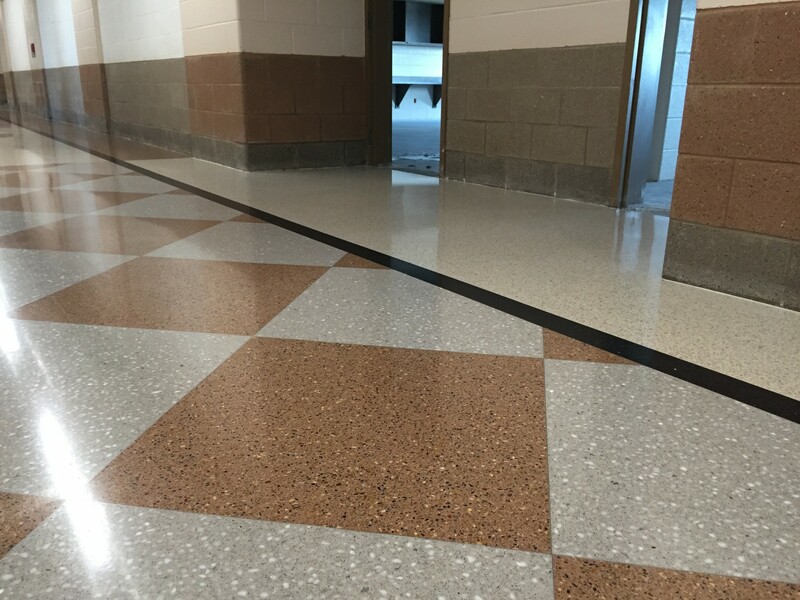 They help separate different terrazzo colors and help to create complex design patterns. They also are used for expansion joints and transitions to other finishes. There are multiple components to a terrazzo mix. It is a combination of marble or glass aggregates blended together and then mixed with epoxy resin or cement. Once the specified materials are mixed, it is then poured out on the floor using a hand or power trowel, then spread evenly at 3/8’’ thick. If multiple colors are specified, each color must be poured separately according to the design. Typically, adjoining colors cannot be poured the same day due to bleed through of the resin. It becomes a highly sophisticated paint by numbers on the floor. It takes about 8hours for the mix to cure out and harden before walking on it. After the terrazzo is poured and cured, then it can be ground. This involves using a floor machine with diamond plated grinding pads that rotate. There are different grits of diamonds used that take the floor from a rough to a smooth surface. Once the floor has been rough ground it needs to be grouted. There will be micro scratches and pinholes present in the surface that will need to be filled in. The grout is the same resin color as the mix and it is troweled over the floor to fill in any pinholes. When the grout is cured, then the terrazzo can be polished. This involves the same floor machine using resin bonded pads and water. Polishing removes and scratches that are left and leaves the floor near completion. The final step is to seal the floor with an acrylic water based sealer. The sealer helps give the floor extra protection and gives it the finishing shine.